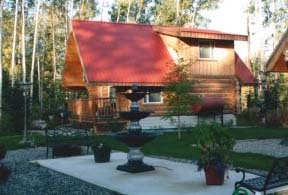 Delta Junction, Alaska offers many great places to stay. We have apartments, bed and breakfasts, cabins, campgrounds, motels, and RV parks. Here is a list of most of them. Alaskan Steakhouse & Motel Open Year-round. Tel. (907)5175. Established restaurant, bar, and motel located right in the ‘Heart” of Alaska at mile 265 on the Richardson Hwy, in Delta Junction. Big Delta State Historical Park, at Mile 274.5 Richardson Highway, includes the restored turn-of-the-century Rika’s Roadhouse as well as several other restored cabins and buildings. Rika’s Roadhouse was the site of the Tanana River crossing of the gold rush trail from Valdez to Fairbanks. Delta Historical Society operates a museum in the old blacksmith shop; displays at the museum include period photographs and collections of pioneer and native Athabascan artifacts. A private concessionaire operates guided tours, a gift shop and limited food service. Parking, toilets and picnic sites are also available. Overnight camping is allowed. Donnelly Creek Wayside is at Mile 238 Richardson Highway and includes camp sites, picnic tables and pit latrines. It’s one of the more scenic campgrounds in the state, located as it is in a mountain valley. Quartz Lake Recreation Area is best known for its excellent sport fishing opportunities. Three miles off the Richardson Highway at Mile 277.8, Quartz Lake offers campsites and overnight camping is allowed in the parking lot. There are also a boat launch, toilets, picnic sites and shelter, and water. Clearwater State Recreation Site is a popular campground and boat launch site. Access is via Clearwater Road off the Alaska Highway or via the Jack Warren Road off the Richardson Highway. Facilities include campsites, boat launch, fire pits, water, picnic tables, and toilets. Fielding Lake State Recreation Site is a scenic campground off the Richardson Highway at Mile 200.5. The rustic campground includes picnic tables, toilets, boat launch, and bulletin board. Delta State Recreation Site is conveniently located near downtown Delta Junction, at Mile 267 Richardson Highway. There are campsites with picnic tables and fire rings, water system, toilets, and picnic area. A gravel airstrip is located adjacent to the campground. This is a popular spot get your campsite early in the day.